This Valentine's weekend, get hot and sweaty and do something special. I'm talking about you taking to the streets in your best undies (yep, you heard right) to join a 1.5 km ish run to raise money for The Children's Tumor Foundation of Australia. 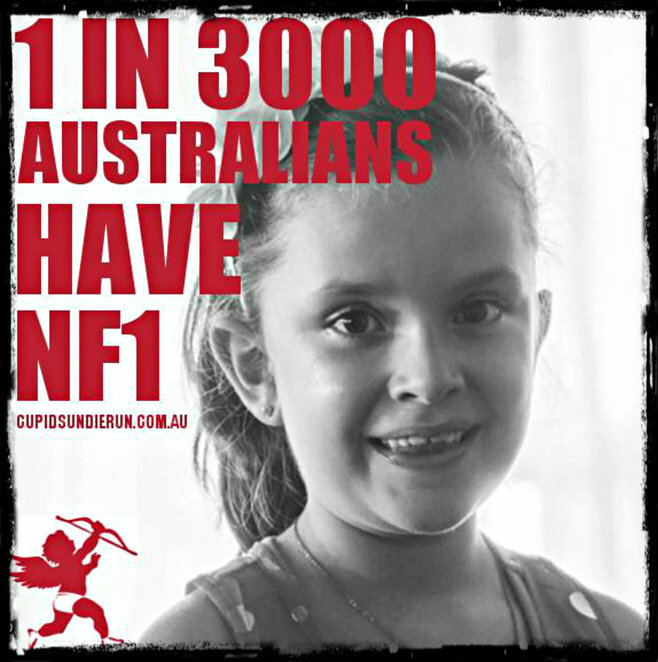 This foundation works relentlessly to find effective treatments for people living with neurofibromatosis (NF), a term for three disorders: NF1, NF2, and Schwannomatosis. NF causes tumours to grow all over the nervous system. It's commonly diagnosed in children and young adults and it can be life-limiting and can lead to blindness, bone abnormalities, cancer, deafness, disfigurement, learning disabilities, and chronic disabling pain. It's a life-long condition. Simply put, having NF means your tumour suppressor does not function properly and every nerve cell in your body has the potential to become a tumour. As a result, it presents multiple health issues across a lifetime. CLICK HERE to read more about this condition. There's some new stuff this year. 1) The Brisbane event has moved to Surfer's Paradise in the Gold Coast. 2) You'll be given more incentives to earn brand new Cupid's flip flops. 3) The shy ones are being given a new $65 ticket option until 12 January 2015 (it's $75 after 12 Jan 2015) that enables you to run in Valentine's Day themed clothes. 4) Cupid's T-shirts are for fundraisers only. If you want one (keeping in mind the 'primary object' here is to fundraise for NF) you have to fundraise at least $25. How easy is that?! You can register as an individual, start a team (all team members have to register under the 'team name' individually) or join a team that already exists. The prizes are even better this year with custom undies, VIP open-bar, flip flops, Timbuk2 backpacks, t-shirts and tons of other stuff, all because you did a good deed and helped fundraise for such a great cause. If you're in a team, fundraising totals from the members will go towards the team total plus each person will still be eligible for individual prizes. CLICK HERE for some guidance on team fundraising. TO REGISTER, 1) CLICK HERE for Melbourne, 1) CLICK HERE for Sydney and last but not least CLICK HERE to register for the Gold Coast. You can also simply donate HERE. If you'd like to become a proud sponsor of this fundraising event, CLICK HERE. You'll find details of the events linked into the name of each individual city that is highlighted in this paragraph. If you have any questions or to further check out details, go to the FAQ section. 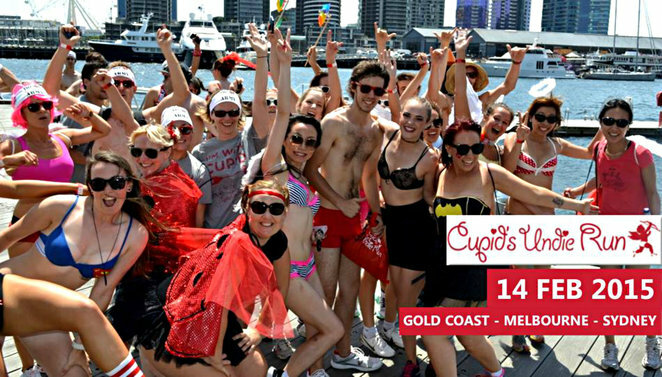 If you still have questions, you can fill in the online contact form, call (02) 97193356 or email: infoaustralia@cupidsundierun.com 'Like' Cupid's Facebook Page to keep abreast of the news. Cost: $55 Brave and Bare registration. $65 (till 12 Jan 2015, then $75 after that date) for I'm a bit shy registration. In Sydney the people will be running at Bar 100 100 George St, The Rocks ?? ?